Diamond drilling at Alpala in northwestern Ecuador. Source: SolGold Plc. 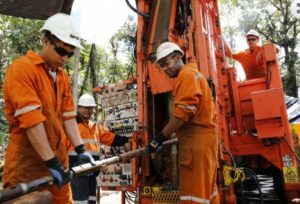 SolGold Plc [SOLG-TSX, LSE AIM; SLGGF-OTC], an Ecuador-focused miner, said drilling at its Cascabel copper-gold project in the country’s high north has revealed previously unknown mineralization, further increasing the potential size of one of the biggest copper discoveries in recent years. The company recently announced its intention to bid for all the outstanding shares of Cornerstone Capital Resources Inc. [CGP-TSX; CTNXF-OTC; GWN-FSE], saying the key advantage of any Cornerstone takeover would be the consolidation of ownership in the Cascabel project, which is 100%-owned by SolGold’s 85%-owned Ecuador subsidiary Exploraciones Novomining S.A. The remaining 15% is held by Cornerstone. However, Cornerstone quickly dismissed the proposal, saying that owners of 50% of the company’s outstanding shares will not support the terms of the proposed offer. The Cascabel Project is a porphyry copper-gold deposit located in the Imbabura province of northwestern Ecuador, which lies within the under-explored northern section of the richly endowed Andean Copper Belt. The tenement is situated on the margin of the Eocene and Miocene metallogenic belts which are renowned for hosting some of the world’s largest porphyry copper and gold deposits, like the giant La Escondida Copper Mine in Chile, which is the world’s largest producer of copper and hosted within the same age host rocks as Cascabel. In January 2019, Solgold released a NI 43-101 compliant technical report containing an updated resource estimate for the Alpala Deposit. According to the technical report, the Alpala mineral resource now stands at 2.0 billion tonnes grading 0.60% copper equivalent (at 0.2% copper equivalent cut-off) in the indicated category, and 900 million tonnes of 0.35% copper equivalent (at 0.2% copper equivalent cut-off) in the inferred category. The contained metal content stands at 8.4 million tonnes of copper and 19.4 million ounces of gold in the indicated category and 2.5 million tonnes of copper and 3.8 million ounces of gold in the inferred category. SolGold has said it was confident that further drilling would expand the deposit in a number of areas including Alpala SE, Alpala NW, Trivinio, and Alpala Western Limb. Judging by results outlined its latest press release, the company appears to be delivering on that promise. “The drilling campaign continues to deliver to our expectations with these latest results revealing previously unknown mineralisation and providing a clear indication of the growth potential that exists through the extension of the Alpala resource,” said SolGold CEO Nick Mather in an April 10, 2019 press release. The 2019 drilling campaign at Casabel is currently utilizing 10 drilling rigs, including three that are focused on resource upgrade drilling, and five on resource extension. Another two are focused on geotechnical, hydro geological and sterilisation drilling. On Thursday, SolGold shares were unchanged at 66 cents. The shares trade in a 52-week range of 31.5 cents and 76 cents.